SERDANG, July 26 – The Faculty of Science, Universiti Putra Malaysia (UPM) had organised a programme entitled 'Science Exploration Day 2018’ to infuse preschooler’s interests in the field of science and technology. Dean of the Faculty of Science, Prof. Dr. Mohd Basyaruddin Abdul Rahman, said the programme is an initial step to overcome the shortage problem of students who major in science in higher learning institutions. "The current situation is worrisome as it is estimated that only 26 percent of students will choose a science major in a local university. Through this programme, preschoolers will gain exposure to the theory of science in an interactive manner to develop interest in science," he said. He added that rapid implementation of the programmes in Science, Technology, Engineering and Mathematics (STEM) disciplines by different stakeholders, especially from the higher learning institutions proved that the society has started to realise the importance of STEM in the country’s development. "The STEM programmes usually organised are only limited to primary and secondary school students. Therefore, we adopt a different approach with a focus on implementing this programme to preschoolers," he said. 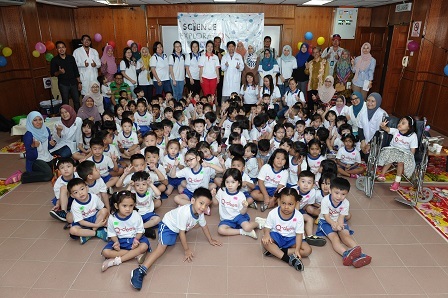 Chairman of the Programme, Dr. Haslina Ahmad, said that the programme, 'Science Exploration Day 2018', which was held for the second time, was joined by 85 preschoolers from Tadika Cahaya Ceria (Qdees) 16 Sierra, to help develop preschooler’s skills such as coordination and accuracy. "These children are impressed when we carry out simple science experiments. They love it when they are able to understand some incidents in their daily life and can use scientific terms to explain them," she said. Meanwhile, eight STEM exhibitions were held to help preschoolers to understand basic science concepts like chemistry and physics.